are my old metal garden chairsas as well as my adirondack chairs which I have shown before but thought I would share again. Slowly over the years I have accumulated all of these chairs. I found every single one of them on the curb and brought them back to life with sand paper, elbow grease and most importantly RED paint. I love turning a piece of junk into something wonderful and useful. They give my yard character and color and the price was right. This is the hall tree that stood in the foyer of the house my husband grew up in. It was his mom’s and it was her mom’s before that. When we started dating it was an “antiqued” finish that was green with varnish over it that made it look old. Then his mom painted it bright blue. You can see the colors when you open up the seat. I always admired it so after we bought our first house she gave it to me. It looked quite different than it does now. It was early american looking with wide molding at the top and some angular coat hooks that were in my opinion, rather unattractive. I don’t have photos of the before unfortunately. Removing the molding at the top and replacing the coat hooks made such a huge difference. Now it has a more arts and crafts look to it. Much simpler. Much more to my taste. I love that it has been in three generations already and I have already promised it to my youngest son when he gets his first house. Hopefully he won’t refinish it by adding molding at the top and painting it blue. But you never know.. There are stories behind both of the cupboards in my kitchen. This first one actually was in the back room of the Salon I used to work at. It was a basement shop, really nice with stone walls, very vintage. When they sold the old home that it was in I asked the owner of the building if I could buy it. I had noticed the cupboard for a long time. It held a lot of cleaning supplies. When we went to pick it up my husband and our friend had a terrible time getting it out. It was as if they had put the walls up around it. Luckily they are very clever and were able to get it out. She sold it to me for only $100. Can you believe it? I couldn’t get that home fast enough. When we moved to our house we live in now, we weren’t able to get it upstairs to our kitchen. Luckily, we have a friend who used his crane to put it on our second floor. He lifted it to our front porch and we brought it through the house. Nice to have those kind of friends! It holds all of my dishes and all of our cupboard food. It’s huge! That cupboard has quite a history. The second cupboard has a story also….when we were redoing our kitchen in our old house, I found this cupboard at an antique shop. It was hot pink! It is a step back cupboard that the top is seperate from the bottom. I repainted it and it was wonderful in my “new” kitchen. Since the top part was hung on the wall as a dish cupboard, we used the bottom half as an island. I had a marble top from a pier one table that fit the top like it was cut for it. Destiny, I say. So when we moved I left the hanging part since it was a big part of the cupboards of that kitchen. Luckily, the girl who bought my house decided to remodel again so she called me about a year later and offered the cupboard to me. I had asked her to call me if she ever got rid of it and I would buy it from her since it matched the bottom part I already had. She only wanted my husband to come and remove it. She didn’t want anything for it. What a peach. That was so great of her. So now I have the two of them together again in my kitchen. I just love them. ~”I collect antiques. Why? Because they’re beautiful.”~Broderick Crawford. If you saw my post two weeks ago about picnic baskets, I promised to show the progress of the dresser I bought that day at a garage sale. It was in rough condition but I hoped it was a diamond in the rough. I paid only $15 for it. After a lot of sanding and a lot of elbow grease, and $32 worth of knew knobs, it is looking good. My husband has reinforced it in many places. She was a bit on the wobbly side. He still needs to add one more fix to the bottom drawer. It had broken when I dropped it out of the back of my car when I brought it home. Thank goodness for that very handy hubby of mine. Now we have a beautiful dresser to put in our grandaughter’s room. We already refinished another dresser and now this one. She has more dresser space than I do and she is not even born yet. Go figure. I am posting this for Vintage Thingie Thursday since we found some vintage windows on the curb last fall, and they inspired this entire project. With a bit of wood found in the garage and a quick trip to Home Depot, we had the makings of a fun weekend. It was a gorgeous day last Saturday on the first day of Spring, and we took full advantage. My husband (the wonderful guy that he is) has been planning on building me a cold frame for this spring. then he put on some wheels so we can move it to the sun or in and out of the garage when the kids want to play basketball. Also wheels could come in handy if we have a bad frost coming, I can just roll it back a few feet into the garage. a great cold frame to hold all my fledgling seedlings. my garden has to look good this year. 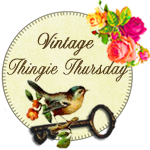 Visit Suzanne to see more Vintage Thingie Thursday Posts. Trying to think of something interesting to write for this post and right under my nose were two vintage thingies just waiting to inspire me. So here is a vintage aqua canning jar filled with marbles. Some are really old, others belonged to my boys growing up, In any case, they are colorful in the light. The other is a ceramic dog I found on ebay a few years ago. He makes me laugh. Now there’s a face! Both of these are on my desk and give me somthing to gaze at when I am lost for words. *Be sure to check out the side bar to find out about Garden Shoes Onlines’s Give Away. Just upload a picture of spring coming and you get a $10 Gift Certificate and a chance to win the $200 drawing on the first day of spring. You don’t need to be a gardener to find something you like. Garden Shoes Online has so much to choose from and we will be adding new products for Spring over the next few weeks. Found this guy at the Madison Bouckville Antique show last summer. It is an old soup terrine. It says Italy on the bottom. It appears pretty old, but even if it isn’t, as soon as I saw that face I knew I had to get it. That and the aqua color on the bottom made it irresistible to me. So I took him home and he sits on my stepback cupboard in the kitchen watching the goings on at our house looking a bit worried. Maybe he thinks we will be making rabbit soup. Valentines Day is the best. It’s all about love and the color red. Any day that involves the giving of chocolate can’t be anything but great. Last but not least, there are flowers~ especially roses. *I found all of these valentine’s in a box of photos in my mom’s attic, years ago. Visit Colorado Lady for VTT. This metal flamingo was on the screen door of a little “summer house” in my husband’s back yard, growing up. It was there as long as I remember and we started dating at 15. I would say that it qualifies for vintage. The house was really a screened in porch attached to the garage where they could enjoy being outside on hot days bug free. It was also a place to have sleepovers when they were young, mosquito free. We always had family parties and cook outs there in the summer time. I have always liked it and now it is on our fence. I should take it out of the weather but I really like it in my garden. 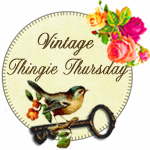 Visit colorado lady’s Vintage Thingie Thursday! I didn’t have anything garden related to show for vintage thingies thursday so I thought I would share something that would spark a bit of humor on this cold dreary winter’s day. I found this picture among a box of photos that I purchased from an elderly gentleman at a neighborhood garage sale. I got a kick out of this one. They look like they are having a fun time. Boy am I glad they have come up with better swim-suits. I am not sure which is worse, the mens or the women’s although full coverage for men may not be a bad idea. The women could use a bit more support and I don’t mean the kind the one girl is wearing rolled up to her knees. The swim hats the girls are wearing are a hoot. I just wish I knew the story behind this picture. Or maybe I am glad I don’t.